The longer I garden naturally the more I understand that there are just a few hard fast rules for how one manages or lives with the garden. The rest is fluid, not so rule bound. If it works right your organic garden is a part of your property’s micro-ecosystem. The rules I have chosen to hold hard and fast to are just four. No chemically manufactured pest control or fertilizers, only organic matter in the garden, no plastics therefore, and no killing. You may have your own set of garden principles that you hold to. When it comes to pest control my practices have changed a great deal having to do with my experiences and lessons learned in the garden over the years. I don’t remember ever using chemical pesticides on my vegetable garden, but there was a time when I would mix and spray Thuricide against caterpillars. Thuricide BT is the brand name for Bacillus thuringensis kurstaki . It is a product made from the spore of a bacterium that when ingested by the caterpillar grows crystals in its digestive tract which cause it to quit eating. The worm dies anywhere from 12 hours to 5 days after ingesting the bacteria spores. There was something about that for me that didn’t seem to quite fit with the role I saw for myself in the garden. I quit using that and began doing hand to hand combat with caterpillars, or scissor to worm really. I would get out there and cut them up. It was more direct, and certainly more immediate. 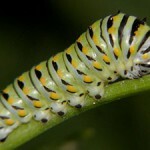 I learned my lesson one spring when caterpillars came to my dill which had gone to flower. The dill flowers are lovely and leaving them to flower means I will have seeds for the following year. Once the dill goes to flower there are no more leaves to harvest. I came outside one morning and found dozens of giant green caterpillars eating on my dill. Powered by righteous outrage I grabbed my trusty scissors and began cutting. Oh what a green mess their severed bodies made. Are you asking yourself why was I cutting up worms on a crop I wasn’t going to consume? Good question. It was my way. Kill worms. I had decided on it, gardened by it and didn’t bother to think on it beyond my original policy decision, but that isn’t the worst of it. Read on. A few weeks later I was thumbing through Rodales Illustrated Encyclopedia of Herbs (What a great reference book.) and there I see a picture of the very caterpillar I was wiping out. 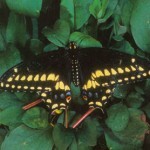 They were Parsley Worms, and Parsley Worms become Swallowtail Butterflies! I cut dozens of them! Now you see the full nature of my crime and the problem with thinking that everything that eats at your vegetable garden is an enemy. Here is how it goes for me now. 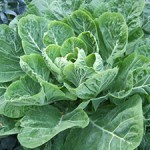 I grow varieties of greens including mustard greens, and collards, chard, and salad greens. I have had caterpillars swiss cheese my mustards, while completely ignoring my salad greens, chard and collards. So I let them have some mustards, no big deal. One year after months of collard green harvests, and a freezer full of collards caterpillars came. They were very small at first, and there were lots of them. Everyday I went out and looked at them. Their sized probably more than quadrupled over the course of a few weeks, and they ate huge quantities of collard leaves. I am talking big leaves chewed to the stems. They ate them all, and then they ate the stems too, and below the plants were mounds of green manure. I was thrilled. There was the beginning of my amendments to the soil for the next crop cycle, and I hadn’t touched a shovel or a wheel barrow to get it there! Meanwhile my fresh crop of mustards went untouched. See yet what I am getting at? This summer I planted Black Eye Peas. We had lots of rain and the plants came up huge and strong. About the time they began to flower I saw aphids. In a few days there were grey fuzzy mats of aphids over much of the plants’ parts. Also present were the ants that farmed them, and lots of wasps, and an army of lizards below. I just knew it would balance out, but to begin with I began hosing the aphids off every couple of days. That would help until the next morning. Not many days later I began to see lady bugs, and then their larva. (Oh man larval lady bugs are scary looking, and I found out they bite!) I stopped hosing the aphids off of the peas when the ladybugs came. In a week more the aphids had diminished a great deal. My peas are still producing, and the aphids are so few that they are no longer a problem. Here’s the idea I am trying to get across. For me it has become important to view my vegetable garden as part of the ecosystem of my yard. I build my soil, I plant the right plants for the time of the season, I provide water when needed, and pull out competing weeds. I plant lots of varieties of vegetables, rotate crops and consider plant companions. Sometimes I plant by the moon, sometimes I don’t. Outside of my vegetable garden I have a good bit of diversity in my ornamentals. My plants have everything they need to survive. Sometimes they do sometimes they don’t. That is how it is in nature too. The cool thing about my organic picture is that I am not the controller of everything. I do my best, and then I am an observer, a tender/helper, and a harvester, and most of the time there is something wonderful to eat from every crop I plant. If you think your garden has to be perfectly ordered by you, and perfectly productive, perfectly pest free, and must make produce of perfect shape size and complexion sit back down and have a reality check. Revisit your reasons for growing food at home. Consider the importance of what you are doing for your local environment. Remember that the words natural, organic, and sustainable are labels that suggest balance. Balance is not about forcing outcomes, it is about sharing your world and accepting its ebb and flow. Be a benefactor of all things in your garden, be a thoughtful observer, and continue to question your practices and your motives. For those of you who are still using chemical pesticides. I have heard what these nursery guys tell people to whom they are selling pesticides. They talk about their safety, their half lives, their narrow effectiveness. Please remember pesticides do kill beneficial insects as well as the pests you are targeting. They also have a detrimental effect on the beneficial frogs toads and lizards living among your plants in your garden. If you are not careful about storing and spraying the pesticides chances are you will expose yourself, your family and your pets. Creating those pesticides created pollution, and used petroleum products, and shipping them to your garden center compounds that again. Using pesticides has a cascade effect, that is the more you use them the more you will need to as you disrupt the balance that might otherwise have ordered your garden. I have seen lots of natural home brew pest spray recipes published on the internet. Most of them contain garlic and other herbs, and some soap. If you must spray something one of those would be a better option. This post reminded me of when my passion vine attracted a bunch of ants that I thought were biting red ants that would make it a nuisance for me to get to the fruit when it was time. I washed them off and squashed some. Not as violent as cutting ’em up 😉 but then I did some research and realized they helped pollinate the vine and were not red fire ants. I felt guilty for days about the poor little ants. They were just doing their job! Society makes us into control freaks. Nature has a handle that sometimes we don’t understand. We just have to sit back and observe and let it take it’s course. Our instructor always stresses on how to think permaculturally versus linear. Think like the earth. If we recognize its processes, we don’t fight it and we live in cooperation with it, never against. Thanks for your comment Chastity. You are so right about the human drive to control things. Thanks for the great read! I came here looking for answers to the swarms of aphids I’ve been finding on the stems of my black eyed peas and what to do about them. While monitoring the situation, I noticed swarms of ants traveling up and down the stems as well. Having read this post, I now understand all is well in the organic ecosystem in my yard! Thanks a bunch! Thanks for your comment Dexter. Those ants are farming the aphids for the sweet fluid they are sucking from your pea plants. 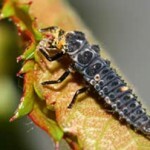 If you continue to watch you may see lady beetles and their larva eating clearings through the aphids. If you see yellow eggs on the leaves those are lady beetle eggs. If the predaceous insects don’t overrun the aphids you can also cut the pea plants down and let them lay on the soil. 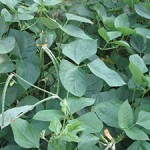 It is good for the soil, and if the plants are young enough they will sprout again from the stalks for another crop.